TERMS AND CONDITIONS STORAGE FEES: As space is limited, there is additional fee added for any packages that are not picked up within 14 days. The fee will be the price of the package(s) for up to an additional weeks storage. After 60 days the parcel will be considered Abandoned. ABANDONED PARCELS: All parcels left at our facility for more than 60 days, will be considered abandoned, and donated to charity. Unless we’ve heard from you, and have agreed upon a later pick up dates. DAMAGED PARCELS: If a parcel arrives with visible damage to the packaging we will note it in the Parcel Notification Email that we send to you. If a parcel arrives with a high likelihood of damage to the contents of the box we will refuse the shipment and notify you that we have done this. OVER-SIZED / UNUSUAL SHAPED PARCELS: Longer than 3 feet or two sides longer than 20 inches will be charged an additional handling fee of $2.00. Unusual shaped parcels that require storage in a special place will warrant an additional charge of $2.00. PACKAGES SHIPPED WITHOUT A NAME: We will do everything we can to find the owner of the parcel however if we are unable to locate you which includes opening the package to look for paperwork the package will be considered an Abandoned Parcel and will be subject to the 60-day Terms, after 30-days.Use only the name/names with the associated ID number, to help ensure proper e-mail notification. INSURANCE: You must provide insurance for your items while they are being stored at our facility. We do not provide third party insurance. Be sure your insurance policy covers your goods when at Point Roberts Parcel\’s Parcel. Cash Jewelry or items of priceless nature are not permitted to be shipped through most common carriers. If you do ship such items you do so at your own risk. ILLEGAL GOODS: We do not condone illegal trade or activity (as defined by the US Federal, State or City ordinance) through our normal operations, we will not hesitate to report it to the applicable law enforcement agencies. Packages may be opened if there is a reason to believe that a package may contain dangerous or illegal goods. FIRE AND THEFT: Point Roberts Parcel\’s Parcel will not be held responsible for any loss through fire, flood, acts of God or any other event that is not within our control. COD’s: We do not accept COD shipments. BOX PACKAGING & MATERIAL DISPOSAL: We will supply recycle bins for recyclables and garbage bins for packaging not recyclable. Excessive packaging may be subject to additional charges for disposal. CHANGES TO TERMS OF SERVICE: We will from time to time review and see the need to change our Terms of Service, we will then make every attempt possible to inform our customers in a timely manner. Changes will be posted to the Terms of Service on our web page and as well posted in a highly visible area at the store. EMAIL NOTIFICATION: Email notifications are sent as a courtesy to you. Please track all of your orders to ensure you know when they have arrived and allow 24 hours for processing. Point Roberts Parcel is not responsible for making sure your email notification has reached you. We will not waive pick-up or storage fees if you have not received notification. MISSING PARCELS: We sign for all UPS, FedEx and freight shipments and take responsibility for reimbursement in case of loss. 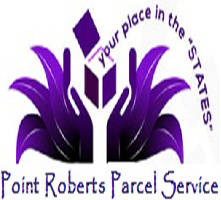 Please be advised that Point Roberts Parcel only signs for USPS parcels that require a signature, eg., certified mail. If not signed for, we DO NOT take responsibility for reimbursement in the case of lost or mis-delivered parcels. POSTAGE DUE: If your item comes through the Post Office with postage due owing on it, we will cover the amount, but will put a note in your email alerting you to the fact that you will owe, in addition to the depot fee, the amount of postage due.